The game was shortened to 40 overs per side, and bowling first Tyrone Kane (1-34) made an early breakthrough before the ECB Development side - led by former England Test batsman Mark Ramprakash - recovered with a second wicket stand of 41 to reach 52 for 1. However Barnes (5-23) and Ross Allen (2-20) wreaked havoc with the English teenagers middle order, which saw seven wickets for just 34 runs. At 86 for 8 the contest looked over, but Lancashire and England U19's George Balderson hit an unbeaten 53 to help the hosts to 171 all out - with Rory Anders (2-35) picking up the last two wickets. Gareth Delany hit a quick 41 from 45 balls, which included 3 sixes and 3 fours, sharing an opening stand of 70 with the in-form Jack Tector. Tector and Doheny kept the innings ticking along with a second wicket stand of 48, before Doheny fell for 27. 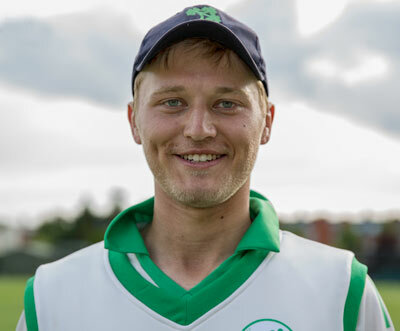 Marcus O'Riordan and Aaron Gillespie both fell cheaply, but skipper Neil Rock (10*) ensured the six wicket win as he and Tector guided their side home without further loss. Tector's unbeaten 82 came from 85 balls, as he stroked 10 fours and cleared the ropes once. The tour finishes today (WED) when they take on Gloucestershire Seconds in a 50-over clash.